The estate of a person who dies as a resident of New Jersey is potentially subject to both a New Jersey inheritance tax and a New Jersey estate tax. The New Jersey inheritance tax is computed based upon the relationship of the deceased person to the beneficiary. In contrast, New Jersey estate tax is based solely on the size of the estate. Generally a New Jersey estate tax is due if the net value of the estate, other than those assets passing to a surviving spouse, is $675,000.00 or more. Once the net value of the taxable estate (other than that part passing to a spouse), is computed, the tax is computed at an initial marginal rate of 37 percent. Once the net value of the taxable estate reaches $727,175.00, the marginal tax rate on each additional dollar drops to 4.8 percent, and then increases thereafter. 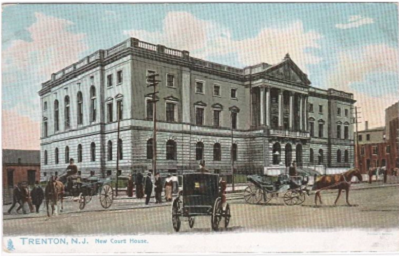 The unusual method for the computation of the New Jersey estate tax is a result of the interaction of the former version of the New Jersey estate tax with the newer version of the Federal estate tax. At one time the Federal estate tax system was structured so that an initial tax was computed, and then there was a reduction in the amount of the actual Federal estate tax due based upon a credit for any estate or inheritance tax which had been paid to a state government. To capitalize on this system, each state then instituted its own estate tax which was designed to collect a tax which was at least equal to the amount of the Federal state death tax credit. By enacting such a tax, a state government could collect additional tax revenue which would not actually increase the burden of taxes on its residents, but which would merely divert money which otherwise would have been paid to the Federal government. As part of the overall tax changes under President George W. Bush in 2001, the per decedent exemption for the Federal estate tax was scheduled to increase over a number of years. Because these changes drastically reduced the amount of Federal estate taxes, including completely exempting many estates, this also caused a decrease in revenue to state governments. Some states made no changes to their laws in response to the Federal changes, and therefore they no longer collect an estate tax. However, New Jersey enacted a new version of its estate tax so that the State of New Jersey would still collect the same amount of revenue from each estate as if the 2001 version of the Federal estate tax had still been in place. The intent was to collect the exact same amount of revenue from the decedent's estate as under prior law, so that it could at least be argued that the enactment of the new New Jersey estate tax did not constitute a tax increase. The current New Jersey estate tax system is structured so that the executor or administrator of the estate has two methods to initially compute the estate tax. Under the first method, referred to as the "simplified method", the executor or administrator computes the net value of the taxable estate according to a New Jersey inheritance tax return. There are certain assets which are exempt from the New Jersey inheritance tax such as the death benefit on a life insurance policy owned by the decedent. Under the simplified method, after the New Jersey net estate is computed for inheritance tax purposes, then these otherwise exempt assets are added back in, and then the New Jersey estate tax is computed, after allowing a deduction for any assets passing to a surviving spouse. The second option for computing the New Jersey estate tax is for the executor or administrator to first complete a Federal estate tax Form 706, in the version of the form used in the year 2001. After the initial computation of the New Jersey estate tax, the amount of the tax is reduced by the amount of any New Jersey inheritance tax imposed on the same estate.